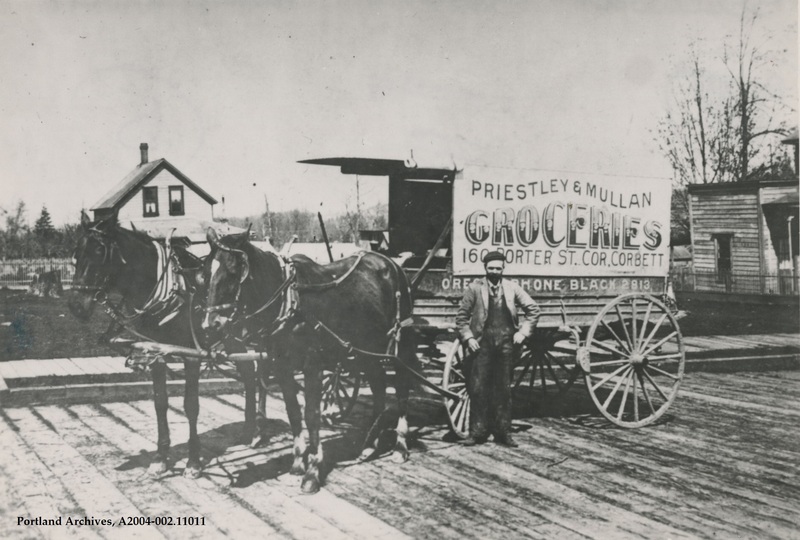 Priestley & Mullan horse drawn grocery delivery wagon, 1910. City of Portland (OR) Archives, A2004-002.11011. 1910 and the road is still planked. anyone know when the last one was pulled up? the 1908 sanborn v2 #167 shows his store on the corner facing north, but that back extension should be 2 stories, and the house behind him, while resembling a house on the sanborn, seems too far from the road. This is probably where Amazon Prime got the idea to buy Whole Foods and offer free 2 hour grocery delivery. @tomjones — 2 seconds (literally!) after VP arrived in my email this morning, an email from New Seasons (grocery) arrived boasting of their tricycle delivery! Minutiae: The photo may date from about 1900 vice 1910. Schuyler C. Priestley pursued many occupations over his lifetime (1869-1934), but it looks like he and Simon L. Mullan (1873-1956) ran their grocery business around this earlier date, according to city directories. In the 1890s Schuyler was a “wood hauler” and fruit grower in Milwaukie, a carpenter in 1918 while his wife Hattie managed apt. bldgs. He even worked at Olds and King dept. store for a while. In later years he managed a real estate loan office on E. Burnside. He and family lived all over Portland, while Mullan stuck close to his roots in Milwaukie where his family owned a farm since the 1870s. Regarding wl’s question about the last planked road that was pulled up, if we can count bridges, that might well be the wooden deck of the Thurman Street bridge across Macleay Creek, which was replaced with steel and concrete in 2014.